Beginning poets can be overwhelmed when they have to keep track of rhyme, rhythm and “AABB” patterns. Encourage your fourth grader to write a skeltonic poem, which focuses on end rhyme. Because it sounds so much like “skeleton”, perhaps your poet would like to write a body-themed skeltonic poem, but any topic is fair game. Teach your child a bit about skeltonic verse. It doesn’t have a fancy rhyme pattern or a particular type of rhythm. All he has to do is rhyme the end sound in each line. He can use this rhyme as many times as he wants—4 times or even 15 times. It is his choice. Whenever he feels it’s appropriate, he can either switch to a new end rhyme or end the poem. With some scratch paper, brainstorm possible topics. What is something he loves to do? Perhaps there is something he’s already written about. Once he has a list of ideas, brainstorm a list of words for each idea. 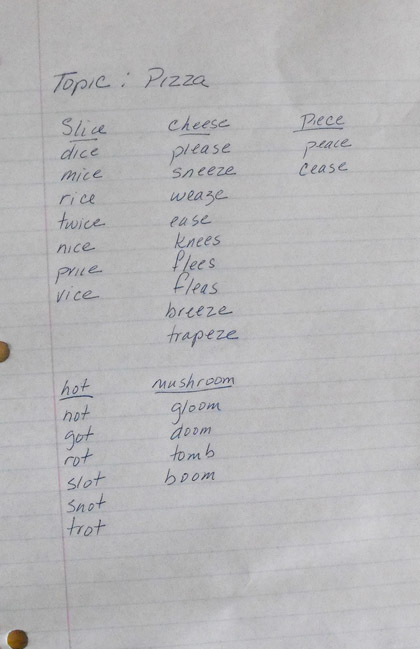 Is there one list in which several words rhyme? Or maybe there is a list that simply has words that would be easy to rhyme. Pick a topic. Now make a list of rhyming words for that topic. Time to write! It might take multiple tries to choose an end rhyme that works. Be sure that he knows it’s OK to struggle with this process. Try doing your own poem along with him, and let him know he isn’t the only one having to scratch things out and try again. 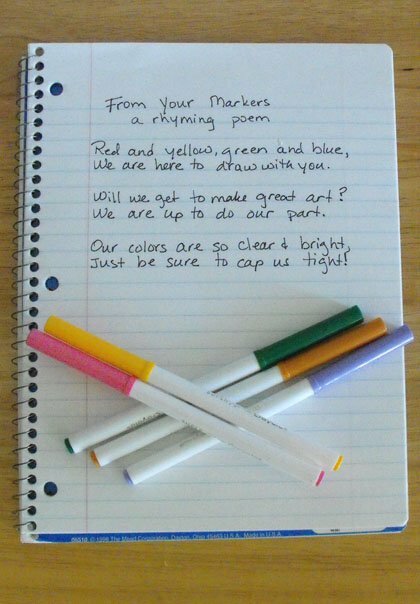 Add to the fun by trading one poem back and forth. He writes one end-rhyme until he reaches a stopping place. Then you pick a new end rhyme and add to the poem until you reach a logical stopping place. Give it back to him for another addition.